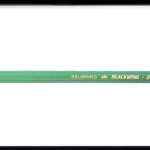 March 2019: The Blackwing 811 is a tribute to libraries and the hope they represent. It features an emerald gradient finish and gold ferrule inspired by the iconic green lamps that light the halls of libraries around the world. Contains the firm graphite.